Much research in entrepreneurship presents results as if they are universally and timelessly valid. 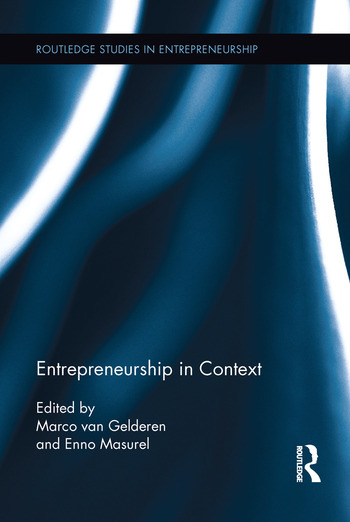 Entrepreneurship in Context takes the opposite tack – it studies entrepreneurship as a context bound phenomenon. For entrepreneurship, the importance of context goes beyond gaining understanding and avoiding mistakes. The reciprocal influence exercised by the entrepreneurial venture and its corresponding context is at the very heart of the entrepreneur as an agent of change. The book addresses context in a narrow sense, i.e. a person’s life situation and local, situational characteristics. It also deals with wider contexts such as social, industry, cultural, ethnic, sustainability-related, institutional, and historical contexts. The book studies the interconnectedness of all these various sub-contexts. It zooms in on the actions that entrepreneurs take to involve, engage, and influence their context and shows the changing and dynamic nature of context. It provides lessons for entrepreneurs about which contextual elements should be prioritized, engaged and sought out. Marco van Gelderen is a senior lecturer at Massey University, Auckland, New Zealand, and business psychologist specializing in entrepreneurship. In recent years, Marco started to focus his research as well as his teaching activities on individual-level enterprising competences. Enno Masurel is Professor in Sustainable Entrepreneurship and the director of the Amsterdam Center for Entrepeneurship at VU, VU University Amsterdam. His main research focus is entrepreneurship and small and medium-sized enterprises (SMEs), with special reference to innovation.